The regularity and richness of the annual Nile River flood, coupled with semi-isolation provided by deserts to the East and West, allowed for the development of one of the world's great civilizations. A unified kingdom arose circa 3200 B.C. and a series of dynasties ruled in Egypt for the next three millennia. The last native dynasty fell to the "Persians" in 341 B.C., who in turn were replaced by the Greeks, Romans, and "Byzantines". It was the "Arabs" who introduced Islam and the Arabic language in the 7th century and who ruled for the next six centuries. A local military caste, the "Mamluks" took control about 1250 and continued to govern after the conquest of Egypt by the "Ottoman Turks" in 1517. Northern Africa, bordering the Mediterranean Sea, between Libya and the Gaza Strip, and the Red Sea North of Sudan, and includes the Asian Sinai Peninsula. Climate: Desert, hot, dry summers with moderate winters. Eastern stock (Egyptians, Bedouins, and Berbers) 99%, Greek, Nubian, Armenian, other European (primarily Italian and French) 1%. Muslim(mostly Sunni) 94%, Coptic Christian and other 6%. Arabic(official), English and French widely understood by educated classes. 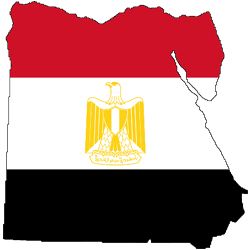 Country name: Arab Republic of Egypt (Egypt). Local long form: Jumhuriyat Misr al-Arabiyah. Legal system: Based on English common law, Islamic law, and Napoleonic codes judicial review by Supreme Court and Council of State (oversees validity of administrative decisions) accepts compulsory ICJ jurisdiction, with reservations. Flag description: Three equal horizontal bands of red (top), white, and black the national emblem (a gold Eagle of Saladin facing the hoist side with a shield super imposed on its chest above a scroll bearing the name of the country in Arabic) centered in the white band. Codes for major Cities: Cairo: 02 & Alexandria: 03. When calling a city from outside Egypt, remove the "0" in front of the local code. The country code is 00 (20) plus Cairo local code (02) - becomes 00 (202). Egyptian Pound (EGP; symbol E£) = 100 piaster. Notes are in denominations of E£100, 50, 20, 10, 5, 1, 50piastres and 25 piaster. Coins are in denominations of 100, 50, 25, 20, 10 piasters. Available at banks, official Exchange houses and most hotels. Banks often have better exchange rates than hotels. All common international currencies are accepted. other services which maybe available. take traveler's cheques in US Dollars, Euros or Pounds Sterling. Banking hours: Sun -Thur 08:30 -14:30.